Today I’m running with Genia Bittner, who is the race director for the Atlantic City Race Series, which includes the Atlantic City Marathon. The race series consists of 2 race weekends, one in the spring and one in the fall. The fall weekend includes race distances of 5k, 10k, half, and full. The spring weekend is a little more unique, with a 7k, 11k, and half marathon distance. So if you’re looking for a PR, a 7k or 11k race might be just what you need! In addition to talking about the race weekends, here are some other highlights from our conversation. 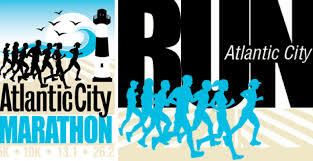 The Atlantic City Marathon is the 3rd longest continuous running marathon in the USA. The course is flat and fast, but watch out for the wind! Creating a 26.2 mile course on a 10 mile island, and recreating it multiple times over the years for a variety of reasons. Things to do in Atlantic City, other than visiting the casinos.